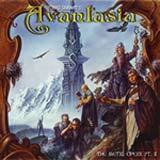 Well, the king & master of True Metal is back with his second and last Avantasia creation. So this is the final chapter and the story finds a conclusion at the end of these excellent 10 songs that are about to be unleashed on 26th of August. But beware that there won't be an Avantasia 3, Tobias said it from day one and the story reflects it, this is the final chapter. I cannot tell you more without spoiling you so I won't, all I can tell you is that for me this is the best album this year ! And I doubt that another one tops it (unless Hammerfall or Lost Horizon prove me wrong later this year). The recipe is the same, take some of the best singer in the Power Metal scene, assign them a role in Tobias' vision conceptual albums. So we found again Andre Matos, David DeFeis, Rob Rock, Kai Hansen and all the other, with the apparition of Bob Catley (Magnum) : a singer I really love ! His presence on Avantasia II is just perfect ! There is less intro like in Avantasia part I with strange voice acting and scene "description" and that's a good thing cause I didn't like those that much. Part I ended on the epic song The Tower. On the opposite Avantasia Part II starts with a 14 minutes epic song, quite progressive and an absolute killer track. The best way to get your attention. The song mixes fast with slow moments with even a rockin' part à la Meat Loaf (I'd Do Anything For Love) with a lot of very well written piano parts throughout the song. I could describe you the songs one by one but that would spoil you the fun, and honestly all track are killers, with some really unbelievable moments and choruses as majestic as never before in either Avantasia nor Edguy. I'm refering to the songs The Looking Glass or Memory, my two favorite tracks on the album although there isn't a single mili-second that doesn't kill throughout this masterpiece. Even the ballads are really nice and are perfectly dosed between the fast moments to put the accent on the storyline in the most efficient of ways. Like always the guitars and rhythm section are strong and steady, solid as a rock and you won't be disappointed there (not surprised either). But where this album is really amazing, it's in his vocal performance, everything is just perfect, everyone sings to the best of their ability, and this time we've got the feeling that the singers are really used how they should and their combined talent delivers a musical and vocals experience like I nothing I've experienced before. With majestic vocal melodies, incredible chorus line, and unbelievable choirs. If you're into great vocals, then this album will become of your most praised possession and an instant classic. Tobias vocals are out of this world, and this album confirms what I thought : that he is becoming (fast) the best singer on the surface of this planet ! The production is near perfect and so is the artcover, thanks to amazing artist J-P. Fournier who did an excellent job as always (though this artwork is much better than for Avantasia Part I). When I was complaining that Mandrake, although an excellent album, was too simple : well, somehow here's Tobias answer to my complaints with this unbelievable album. I'm truly on my knees this time, Toby did it, this is a true perfect album, just like Vain Glory Opera was at its own time (though the progression on the vocals since then have been tremendous). In Tobias Sammet I trust, congratulations for not only delivering a second Avantasia, but for making it even bigger and better than the first chapter. Buy-or-burn forever in the hellish flames of Sto-Vo-Kor !! !